I've installed several phone docks in my car. All of them were successful to varying degress; but in my tiny Neon the dock often crowds the cabin for either me or my passengers. This time I had the idea to mount a desk lamp arm to the floor using the seat bolts. I wanted to be able to bend the arm down between the passenger seat and the center console. I added the dock to the seat by bending a metal bracket and sliding it under the seat mount. The seat still secures tightly. Ultimately, the depth of the dock made it impossible to stow the arm away between the seat and the center console. 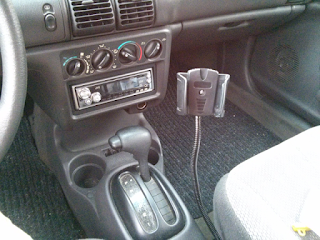 However, since the dock can be moved to hover completely over the center console, it is never really in anyone's way. Unfortunately that means the dock is always visible. I'd like to pursue this idea again. Perhaps a slimmer dock could be created? The following is a comment I posted on a Lifehacker post titled How to Be a Vegetarian and Peacefully Co-Exist at Meal Time. In social situations, we often respond to people with an excuse. "I can't eat this because I'm vegetarian." Even this great article suggests we say "I already ate before I came here." Which is a totally reasonable suggestion. My question is, why is "No thank you" never enough? It's true that people ask why, or try to goad you into eating something until you give them a concrete reason. We do this for a lot of things and I think we should stop. Giving a reason might make you more sociable, but it also takes away your power. Don't want to date a guy? Don't say it's because "I have a boyfriend." Simply say "I'm not interested." If the person has something to say against that then you're not in a safe situation and you should leave.